You didn’t know you had a choice? You’re not alone. I didn’t know either until last year. For most of my athletic life I’ve been doing static stretching as a beginning activity before sport; often with no 5-10 minute light warmup first. I recall a few coaches telling me to do a short jog before stretching. I usually didn’t when alone. When running on my own, I’d usually do some leg stretches in the driveway of my house, and then go for a 10 K run. I’ve met long distance runners who admitted they never stretch before running. I believe that lost distance running is a sport that you can get away without stretching, but I stretch nonetheless. For most of my athletic life I’ve been uncomfortable with static stretching, but didn’t know any alternatives. These days I believe the best athletic warmup for the sports I play is a light jog followed by dynamic stretches. I use static stretching as a cool down activity afterwards. 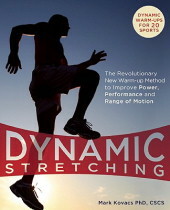 Dynamic stretching focuses on movement patterns requiring a combination of muscles, joints and planes of motion, says my book (see image below). An example of a dynamic stretch: side ankle walk = walking on the sides of your feet for 10 meters (good for runners). The author, Mark Kovacs, says “Dynamic warmups increase core temperature to a greater extent than static stretching-focused warmups. This provides an improved protective mechanism against muscle strains and joint sprains, which are more prevalent when the body is cool. Dynamic warmups mimic the movement patterns and speed of movement that the sport will impose on the body and therefore help to reduce the likelihood of injury as the movement patterns and ranges of motion have been trained during the warmup. ” Kovacs has many letters beside his name so he probably knows more than I do. I wish his book had a video CD or a link to online videos, though. During the recent NBA finals I noticed Dirk Nowitzki, player on the recent champions The Dallas Mavericks, doing one of the stretches in the book (repeated squat jumps), so Kovacs is probably right about dynamic stretching. I like dynamic stretching, and consider it a better warmup than static stretching. This entry was posted on Monday, June 27th, 2011 at 5:29 pm	and tagged with sports and posted in Athletic Preparation. You can follow any responses to this entry through the RSS 2.0 feed.